Imagine work with no days off. Without unions, there would be no weekends, pensions or health insurance. IMPORTANT FIRST STEP: DO NOT READ THIS WHILE AT WORK! 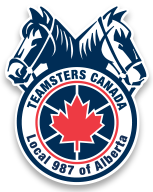 Do not research or discuss organizing or forming a labour union at work until you have contacted Teamsters Local 987 and been clearly advised to proceed. When there is not a union at your place of work, you are not protected from actions that your employer may choose to take. When thinking about organizing your workplace it is important to be very discreet and follow the advice of the Teamsters Union 987 organizer at every step of the way.